Experienced truck drivers pose less of a risk factor and will help lower their truck insurance rate. Truck driving experience with different equipment and weather conditions are inherent in the number of years that a trucker has been driving similar types of rigs. Tip: Hire drivers with at least 2 years of CDL experience. Statistics tell us that truck drivers that are very old and very young are more prone to accident. For this reason, these high risk age groups will have truck insurance premiums that are higher. The preferred driver age is between 30 and 65. Tip: Hire drivers between 30 and 62 years of age. Driver who have had accidents in the past are prone to having accidents in the future. For this reason, the less violations and accidents a truck driver has, the less their truck insurance premium will be. Tip: hire drivers with no more than 2 minor moving violations in 36 months. Similar to newly employed drivers, a newly operating trucking company is more likely to have the added burdens of business growing pains. As the management operations, safety programs, drivers, adherence to regulations, matures, the frequency of loss is more likely to decrease. Tip: stay in business and don’t change or revoke your authority. The different routes a driver has can have an effect on their truck insurance premiums. This is because of the average road conditions and infrastructure, weather during the different seasons, population density, and so on. Tip: avoid large metropolitan areas such as New York, Philadelphia, Chicago, Miami, Houston, Los Angeles. The number of years that a trucker has worked for different companies is taken into consideration as an experience factor. There is less chance of an accident if the driver is more familiar with specific routes and equipment. Tip: Verify all of your prospective driver’s employment history and references. Age, condition and value of equipment operated are a determinant in truck insurance premiums. However, the age of the rig is often irrelevant as the truck’s condition is dependent on upkeep, as well as recently installed equipment. Tip: utilize newer trucks (10 years of newer) whenever possible. The deductible is the amount of damage or loss that the insured party is responsible for when there’s an insurance claim. The greater the deductible the less the truck insurance premium will be. Tip: Use at least $1,000 deductible. Consider having higher deductible such as $2,500. Safety features for an insured truck, such as warning stickers, are beneficial for risk assessment. Company safety programs and driver safety trainings are also helpful. This is record of an owner operator or company DOT safety rating, Safestat and Inspection, Selection (ISS-2) scores, violations, etc. 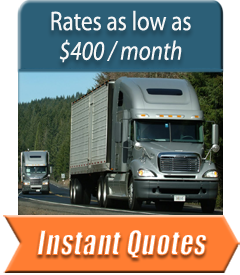 and is routinely used to assist in determination of the truck insurance rate. Last but certainly not the least: Not all agents have the same access to insurance carriers. Not all agents have the trucking expertise you need. Selecting a trucking specialist who knows the business is crucial to get the most value from your insurance dollar. This entry was posted in Insurance Rates. Bookmark the permalink.